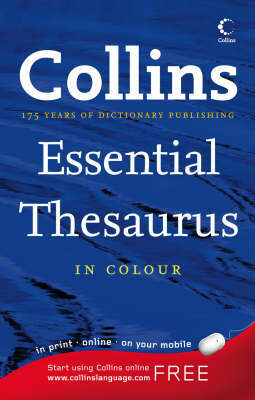 This second edition of Collins Essential Thesaurus, with entry words in colour, gives the maximum choice of alternatives in the most helpful layout, making it ideal for everyday use in home, school and office. It also includes a special supplement, created in partnership with Pitman Training, for help with keyboard skills. Now with colour entry words, this second edition of Collins Essential Thesaurus is the perfect language tool for every situation. With clear, helpful usage notes, and a practical supplement created in partnership with Pitman Training, this is the ideal thesaurus for office use. Specially tailored to meet the needs of the office user, the new colour Collins Essential Thesaurus has all the words and alternatives the user might need, as well as a huge choice of opposites.